Sheltered in the big top of MoMA PS1’s VW Dome on Sunday afternoon, The National played for six hours. While that’s a fairly long gig even by Bruce Springsteen standards, the event was made especially unique by one small aspect: they only played a single song, over and over and over again. Depending on your opinion of the Ohio-born, Brooklyn-based band, this was either a horrifying or an ethereal ordeal. 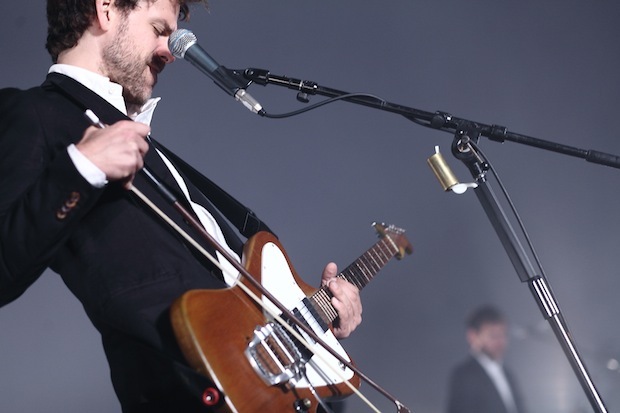 The endurance event was conceptualized by Icelandic performance artist Ragnar Kjartansson, a dabbling musician with an affinity for challenging audiences’ attention spans. In the past, Ragnar has staged operas that repeat the same Mozart aria for 12 hours straight (the Malcolm Award-winning Bliss) and painted a canvas every day for 6 months for the 2009 Venice Biennale (in which he was the youngest-ever Icelandic participant). The difference between some of these projects and this weekend’s aptly titled A Whole Lot of Sorrow was what was being looped. Repetition is a commonly used motif in both art and music, but how many hours of despondent wallowing can one audience handle from one of the world’s most gloriously depressing bands? “Sorrow” is a dirge of a tune, fueled by an almost break-beat-like drum line, a brass section and Matt Berninger’s purposeful, harrowing baritone. A track off their 2009 album High Violet, it begins in a typically National-istic manner: Sorrow found me when I was young / Sorrow waited / Sorrow won. As with some endurance-based art from the likes of Marina Abramovic and Chris Burden, the endless echoing of a lyric can bring on a sense of ennui—until, that is, you break past a certain barrier and come out the other end, into euphoria. John Cage, who once composed 4 minutes and 33 seconds of silence, famously quipped that "If something is boring after two minutes, try it for four. If still boring, try it for eight, 16, 32, and so on. Eventually one discovers that it's not boring at all, but very interesting." 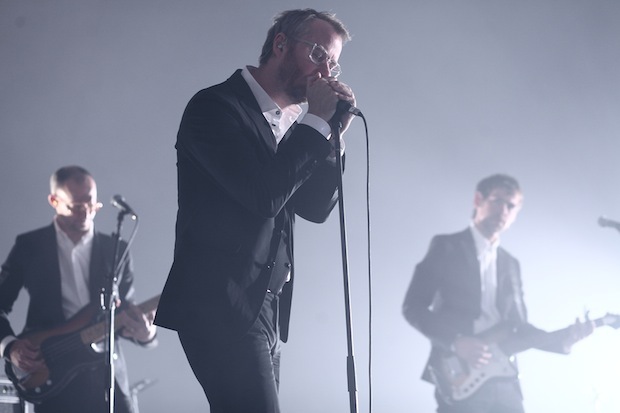 The National and Kjartansson tried it for six hours, and we dare say we’d try it for six more. The first two hours went by in a blur of naïve excitement and fretful anticipation. Kjartansson would appear intermittingly with snacks and wine for fuel, much of which singer Matt Berninger would share with the audience. At the end of every song, the crowd clapped and cheered and roared, appearing incongruously shocked and elated whenever the drums kicked back in for another rendition. Come hour four, fatigue was setting in. Drummer Bryan Devendorf paused to massage his blistering palms, and one of the Dessner twins began playing with a bow, even forgoing his instrument altogether for the space of three songs to muck around with his pedals. The sound desk was more-or-less deserted, save for a half-eaten egg bagel. Questions started to present themselves: does their finger insurance cover RSI? What does that lyric about rags and bones actually mean? Am I hungry? By hour five, we’d heard “Sorrow” roughly 100 times, yet it surprisingly still wasn’t sounding like mushy porridge boiled with tears. True, the stringed instruments were falling out of tune, syncopation was becoming an issue, and the vocals sounded strained, but The National's energy seemed to be picking up. In fact, we were all smiling. It wasn’t until Berninger began to cry, choking on his words in the last ten minutes of the performance, that the well of emotion seemed to finally overflow, and we realized it was our turn to take over. An incredibly passionate a cappella delivery from the crowd ensued, as naturally, we had all 142 words etched in our brains’ gray matter by that time. There’s a shared experience in trauma. We were in this together. And perhaps that’s why, once the band left the stage and Kjartansson thanked us all for enduring it, we screamed for an encore. After a few minutes, the band stumbled back on. Glass of wine in hand and with a weary yet devious smile, Berninger leant into the microphone. We held our collective breath. “This one’s called 'Sorrow,'" he said. 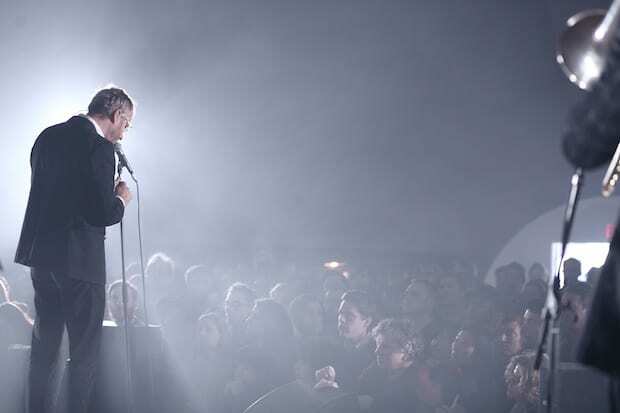 The National’s sixth album, Trouble Will Find Me is out May 21st via 4AD.